Hi guys:) Welcome back. Today, I’ll be talking about mascaras. This post has been awhile in the making, coz I have things piling up on every corner. This will be my last post for awhile – I wanted to do a movie review of Age of Ultron, but it’s going into the backburner since I am (a)under-qualified as a movie reviewer (b)there’s too much I want to say and too little time to say it all. Eventually, I am going to write it, it’s just not going up any time soon. 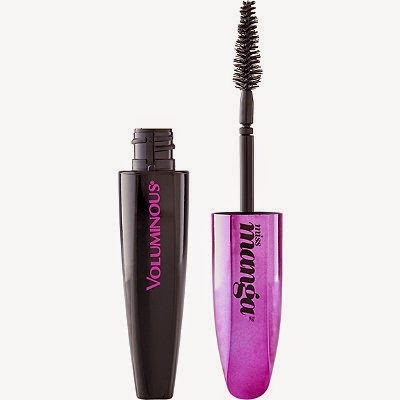 Okay, so recently I bought the L’Oreal Voluminous Miss Manga Mascara. It was its first introduction into the stores, so there was an introductory price for it. I believe it was about SGD19.90. It has a cone-shaped, curved brush, not unlike many curling mascaras like the Maybelline HyperCurl Volum’ Mascara (shown below). I believe it’s to replace the need for a eyelash curler, but IMHO why would there be an eyelash curler, if there was no need for it? As the name states, this is a volumizing mascara. It takes awhile to build any sort of length, which I tried because I thought it was like the Maybellines, which I found could basically do it all (with the help of a lash curler, of course) even if they claim to only be volumizing or curling. Nope. It is very capable for volumizing, but a little iffy on the lengthening properties. For that, I do not recommend this mascara to anyone with short lashes (basically, when lashes look like beard stubble). I bought this mascara because I was looking for a replacement mascara for my Maybelline mascaras. I bought the Big Eye mascara with its introductory price (SGD17.90 compared to SGD21.90), which came with its own eyelash curler. I highly recommend the eyelash curler, since it’s lightweight and has a flatter curve compared to others, which is very suitable for anyone with flat lids. It sounds really weird, but it works. The Big Eye mascara was a meh for me. It’s nice, but for someone who has chronic droopy lashes, the washable volumizing mascara they created for the upper lash (the pink side of the top mascara), it does not hold my lashes up. It also makes my eyeballs sting and water with the formula. I think it’s gone bad, but sometimes my eyes are not affected, and sometimes I can’t even get the brush within a mile of it. 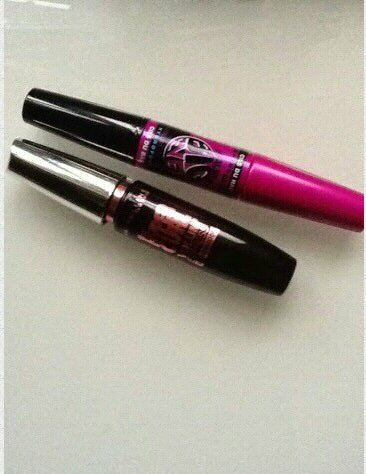 I have the same problem with the Maybelline HyperCurl Volum’ Express Mascara (the black tube with pink letterings). I didn’t start using the second tube until this year, since I was sucked into the Jennifer Lawrence Dior ad, where she had no mascara on (Shocker!). I quit my mascaras cold-turkey, and didn’t look back until recently. I just like the way a beautiful curled, lengthened and volumizing lash line finishes a look, or how it can hold up on its own. But the second tube had none of the magical qualities of the first. And I’m trying to save my money, which does not help my sudden need for mascara. So here’s one last look at the two, before I throw them out. This picture above shows the before and after of the Maybelline HyperCurl. Excuse the red eye, I believe I was reading for too long on my phone, and forgot to rest them. I did curl my lashes in the before, so you can get a gauge of my natural lashes. It looks much longer in the after, defined and a bit of volume, but if you’d seen the magic of the first tube, you might think this is okay. 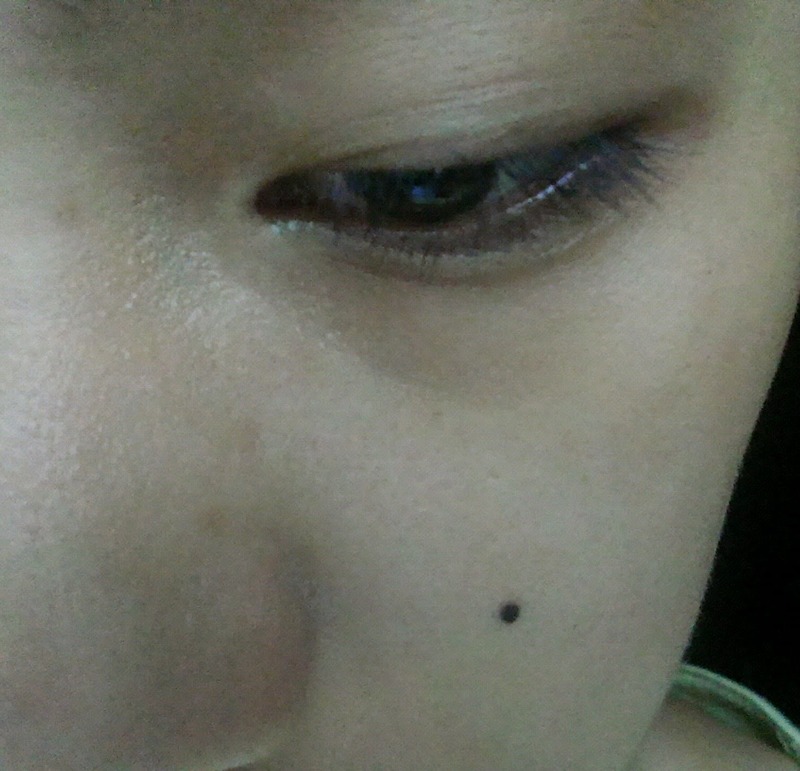 It’s also a pain to remove (which I forgot after a year of no mascara). My right eye (yes, that is my eye) is wearing the Big Eye Mascara. I really like the waterproof formula and brush. It reminds me of the Innisfree Skinny Mascara (although the Innisfree one is much smaller and about SGD13.00), since it not so much as creates a fuller, longer lash than tint and make it look more present. It was for the lower lashes, but I find they do not work that well for me. The far left picture is the curled lash, and the before mascara. The middle one is the effect of the washable volumizing formula. As you can see, it lengthens quite a fair bit, and volumizes a whole lot. The last one on the right is with the addition of the waterproof formula. The two formulas (waterproof and washable) do not mix well, and it’s a hassle to remove. I’m not even going to keep it for sentimental value. So here’s the final conclusion on all three mentioned mascara. – Has a tiny bit of lengthening, but needs to be carefully done or it becomes spider lashes. Here’s everything I want to say about my throwaway mascaras. If anyone know how long you can keep unopened mascara, drop a comment below:) Thanks and bye!